What would high summer be without some daisy-type flowers? They are pure happiness atop a flower stem! Mid to late summer offers a wide range of this simple flower shape. Let's take a look at a few of them. This is my front garden back in 2013. I used to have loads of yellow Rudbeckia along the fence back then. I pulled half of it out looking to add room for early summer flowers, but now that I reflect back at this glorious August display, I am now rather sorry to have been quite so ruthless. Perhaps it is better to shine for a brief time than to look mediocre over the long haul of a gardening season! Sometimes we gardeners have to learn by making mistakes. Now, I'm thinking of swinging back the other way and restoring some of the Rudbeckia. colored Floss Flower, Ageratum in a public park. Rudbeckia also looks great mixed in with annuals as you see here in this display at a local park. 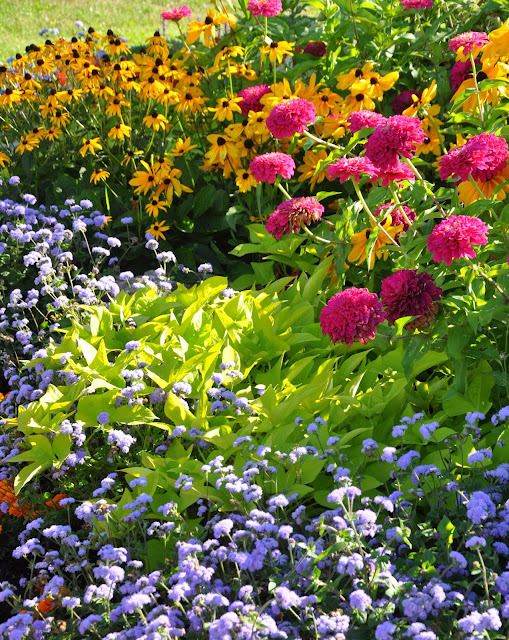 As with most plants you need a big patch of each type of flower to really have an impact. 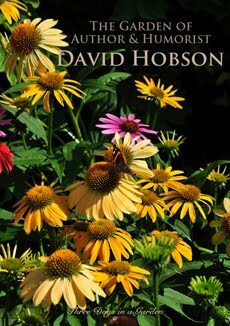 I have two Rudbeckia cultivars to recommend you might try. It wasn't labelled but, I am going to guess that this is the popular Rudbeckia 'Goldstrum'. Rudbeckia 'Goldstrum' has golden-yellow flowers with a black centre. It will easily grow in average garden soil. It likes sun but is also happy in light shade. Removing spent flowers will prolong the display of blooms into the autumn. This perennial has a slow spreading habit but is easy to remove where unwanted. Height: 60-75 cm ( 23-29 inches), Spread: 45-60 cm (18-23 inches). USDA zones: 3-9. 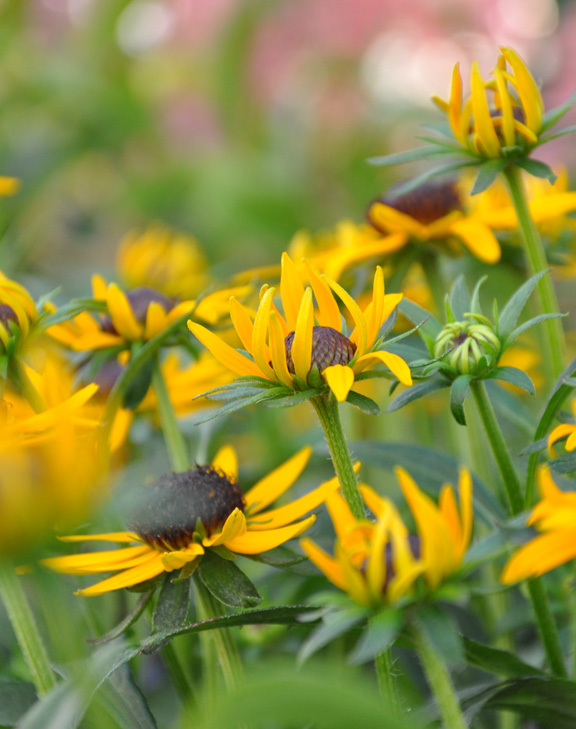 Rudbeckia 'Little Goldstar' was bred to be an improvement on 'Goldstrum'. It blooms profusely on a more compact plant that stands just 14-16 inches tall. 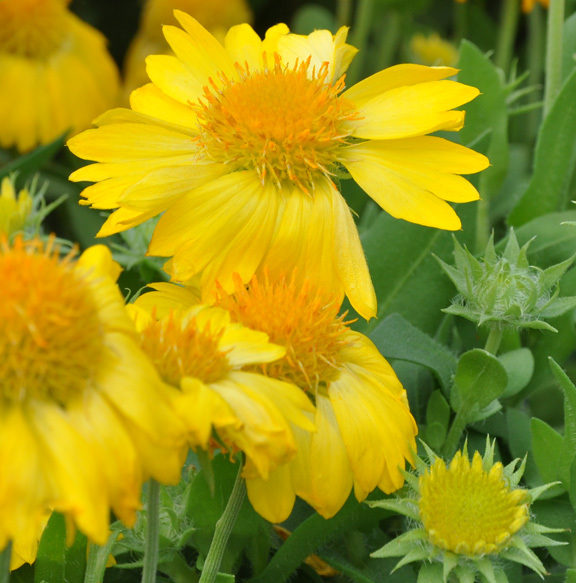 It's an easy-to-grow perennial that will prosper in average garden soil with normal moisture conditions. Height: 35-40 cm (14-16 inches), Spread: 35-40 cm (14-16 inches). USDA zones: 4-9. Echinacea at the Toronto Botanical Gardens. Echinacea in the Landscape Ontario Garden. Echinacea Sombrero 'Adobe Orange' (top left) has overlapping orange petals and a rusty-red cone. It was bred to produce lots of flowers on a compact, sturdy plant. 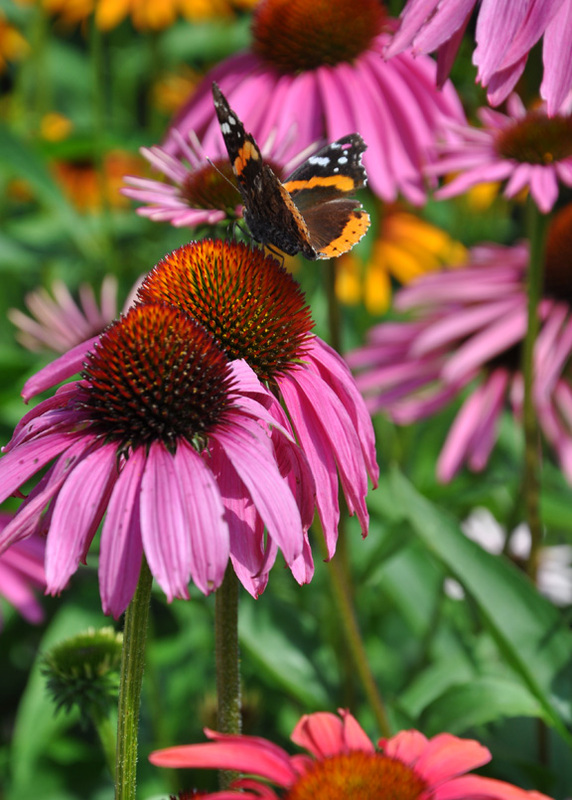 Average garden soil and moisture conditions are fine for this Echinacea. Full sun. Height: 60-65 cm ( 23-25 inches), Spread: 40-45 cm (16-18 inches). USDA zones: 5-9. Echinacea 'Supreme Cantaloupe' (top right) As its name suggests, this echinacea has cantaloupe-colored petals with rosy-red ray petals at the centre of the flower. Full sun. Height: 55-65 cm (21-25 inches), Spread: 35-40 cm (14-16 inches). USDA zones: 4-9. Echinacea Sombrero 'Kim's Knee High' (bottom centre) has coral-pink petals with an orange cone. 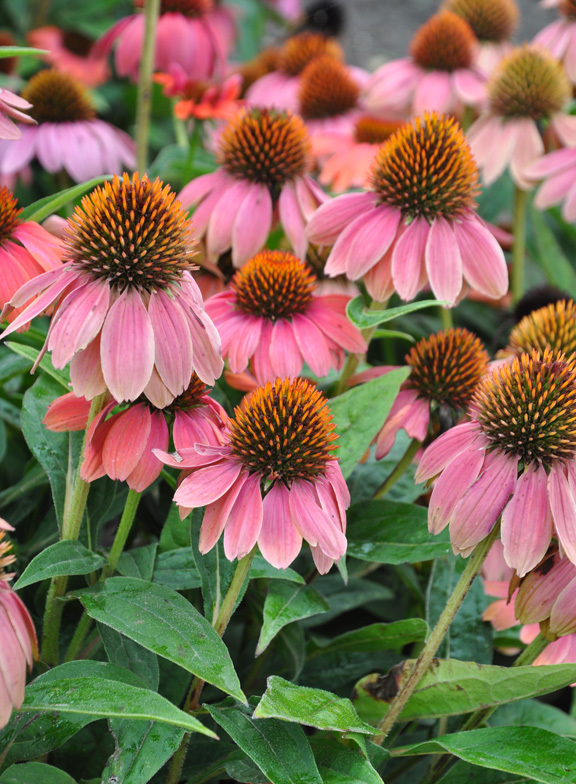 This Echinacea has a compact, bushy habit making it perfect for the front of any flower bed. Full sun. Height: 45-60 cm (18-23 inches), Spread: 30-60 cm (12-23 inches). USDA zones: 4-9. 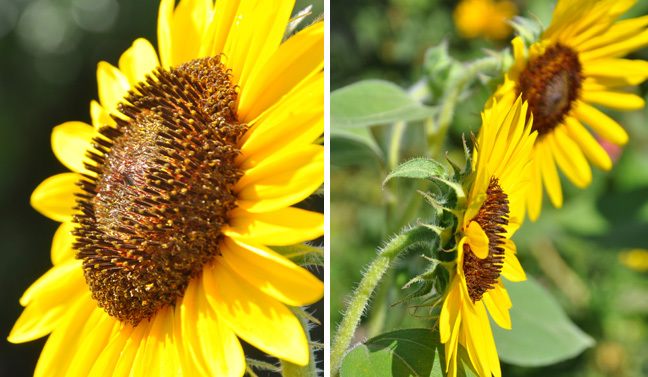 Sunflowers are synonymous with late summer. They are annuals but, they are such great self-seeders once you grow them, you almost always have them in your garden. 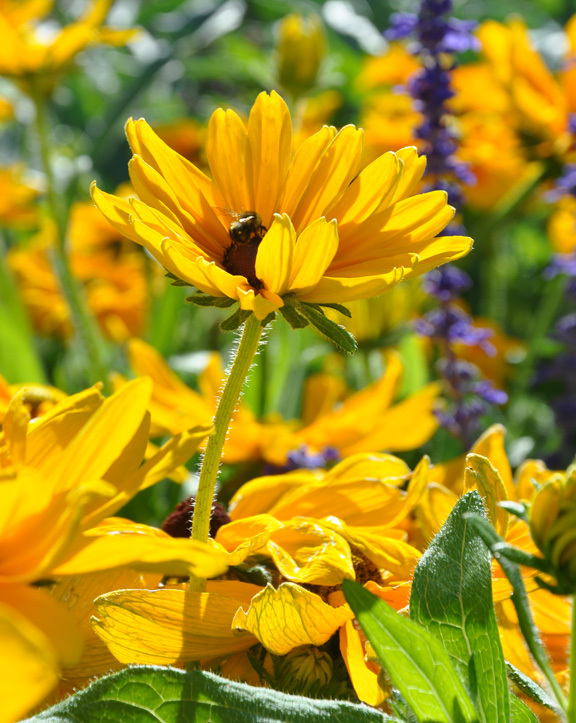 Plant sunflowers for the birds. Goldfinches and little chick-a-dees adore eating the seeds. 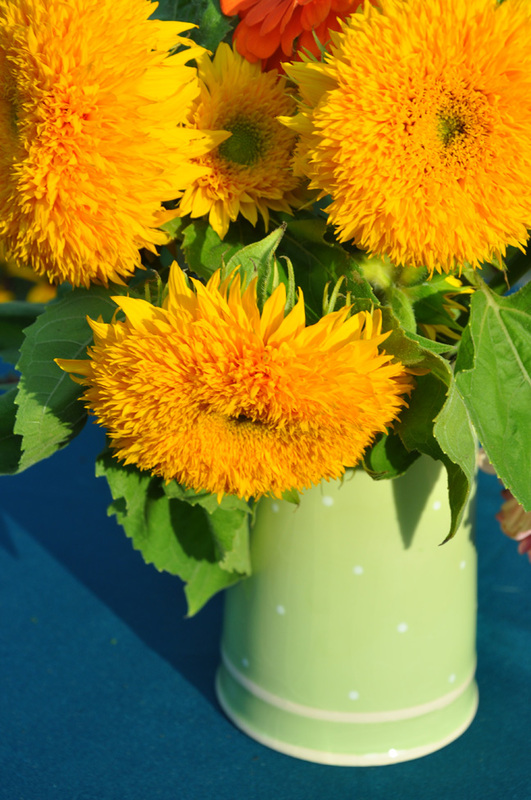 And as an added bonus, sunflowers make great cut flowers! Helenium and other perennials in a local park. To be honest, I've struggled a little with this next plant. 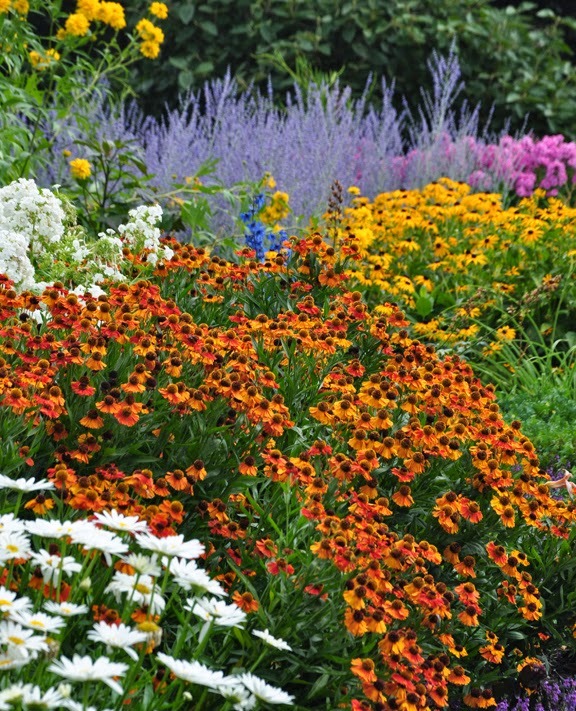 Where do you place a perennial that comes in such vivid shades of red, orange and yellow? I am still searching for the perfect place to relocate my Helenium to set it off to best advantage. Perhaps the answer to that ideal spot lies in this next picture. Heleniums seem to look great against a golden backdrop. That background could be created with an ornamental grass or maybe a non-invasive form of goldenrod. In this image, Helenium is paired with the yellow foliage of a Sumac. 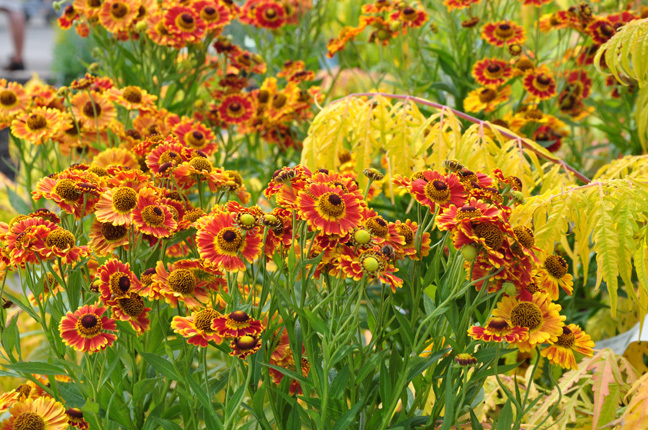 Helenium 'Short 'n' Sassy'(on the left) This compact variety of helenium has orange and gold petals with a deep brown centre. Full sun and moist soil are best. Height: 30-45 cm (12-18 inches), Spread: 40-50 cm (16-20 inches). USDA Zones: 4-9. 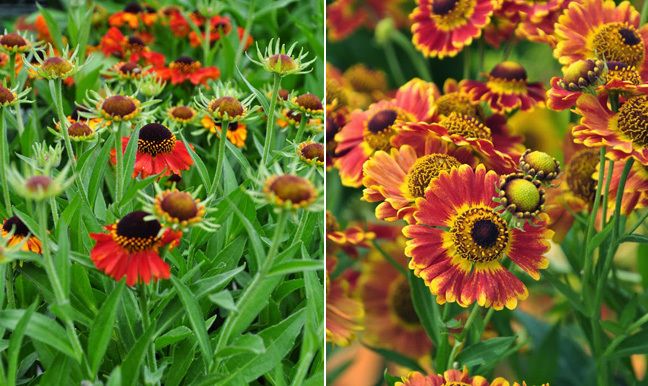 Helenium autumnale Mariachi 'Fuego' (on the right) is another compact variety of helenium. 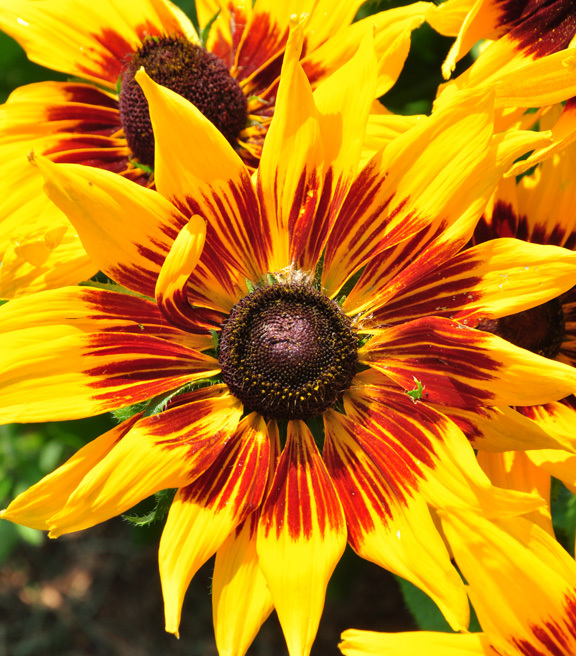 'Fuego' has orange-red petals and a golden halo around a deep, coffee-colored centre. Full sun and moist soil are best. Height: 40-50 cm (16-20 inches), Spread: 50-60 cm (20-30 inches). USDA Zones: 3-9. 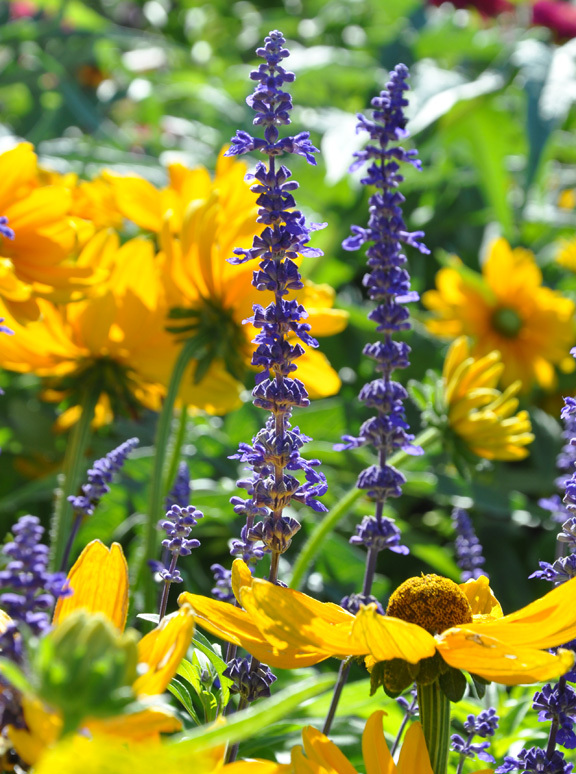 Blue salvia mixing nicely with Rudbeckia in a local public park. 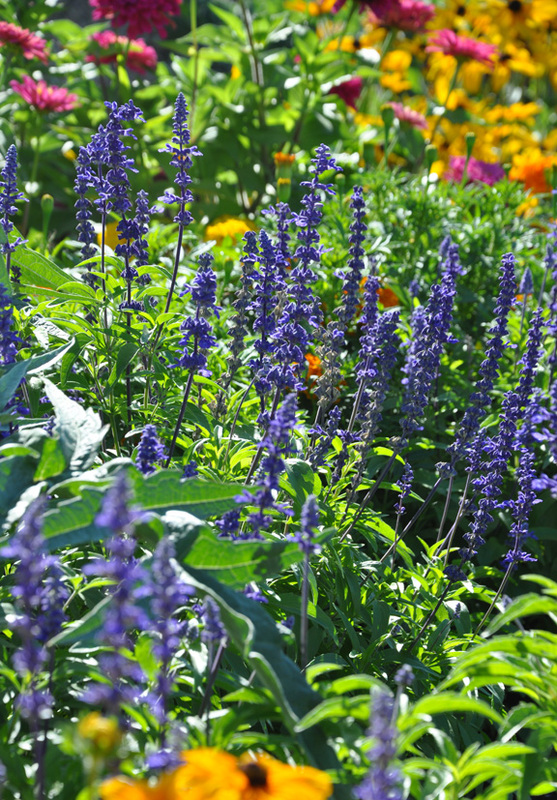 Salvia farinacea 'Victoria Blue' is an annual you can find at almost any garden centre. A few brief words on different varieties of Rudbeckia hirta. 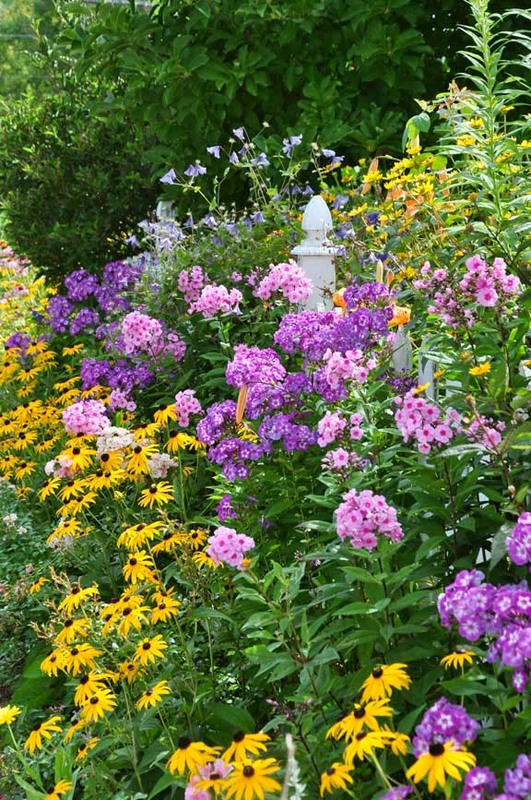 These are short-lived perennials that are often treated as annuals. They will sometimes survive a few winters but are more likely to live on by self-seeding. 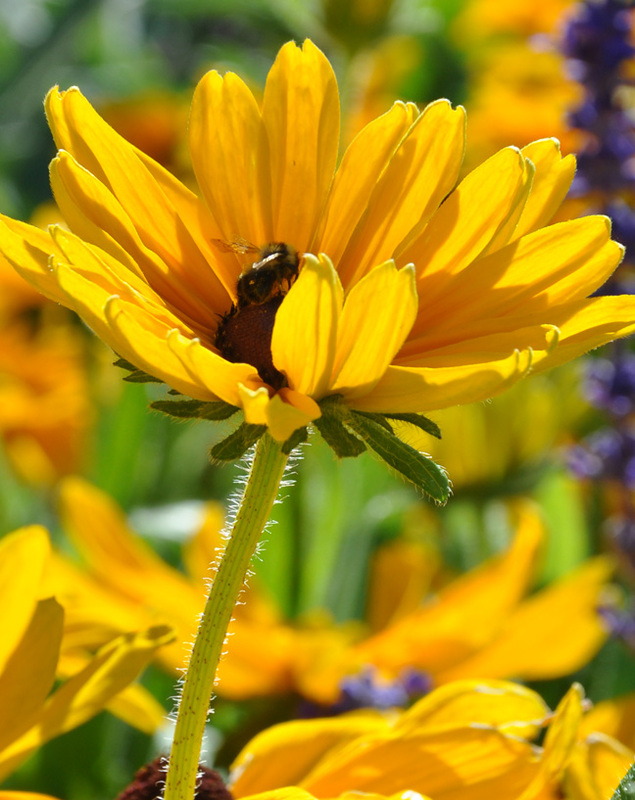 Rudbeckia hirta 'Denver Daisy' at the Guelph trial garden. 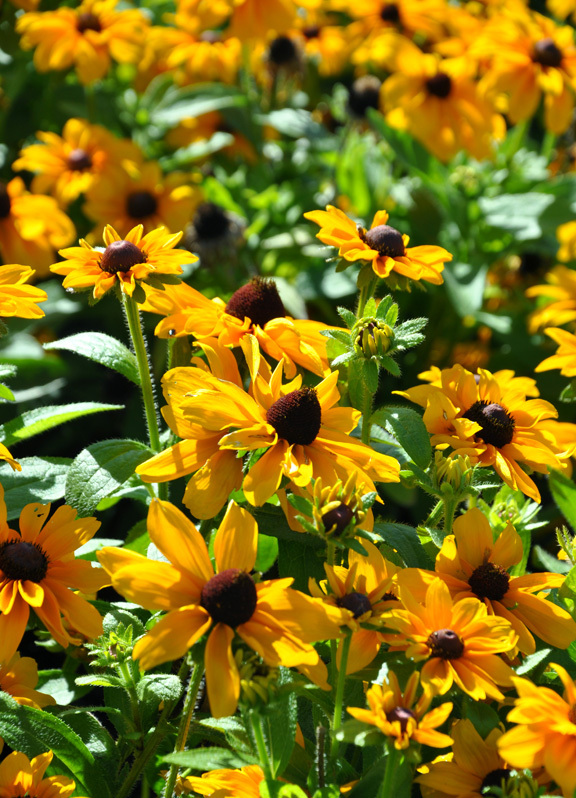 Rudbeckia hirta 'Denver Daisy' has golden-yellow daisies with a red eye and a black cone. It is fairly drought tolerant once established. Full sun. Height: 45-50 cm (18-20 inches), Spread: 30-45 cm (12-18 inches). USDA Zones: 5-9. As well as the taller cultivars, there some more compact varieties of Rudbeckia hirta as well. 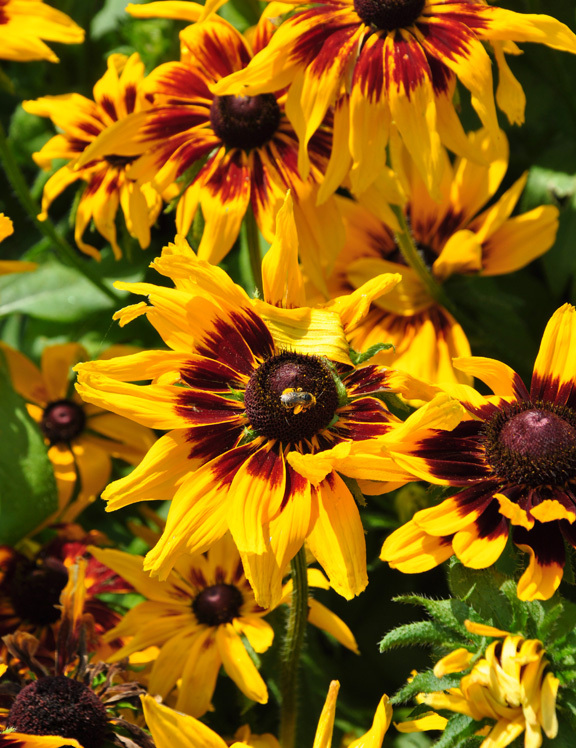 Rudbeckia hirta 'Toto Gold' and Rudbeckia hirta 'Toto Lemon' are two good examples. 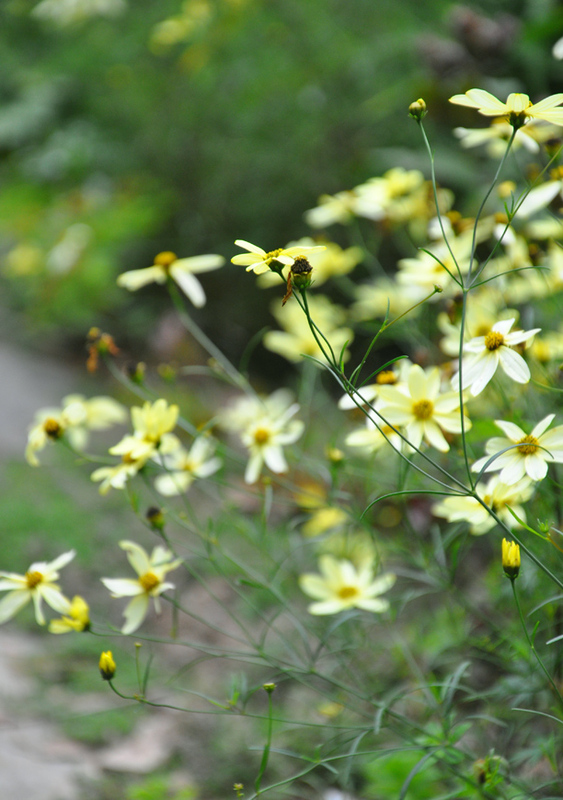 Pale yellow Coreopsis edges the flagstone pathway in my friend Donna's garden. It's a dainty little daisy-type flower that blooms for ages. Donna tells me she sheers her plants in mid to late July to encourage a fresh round of blooms. 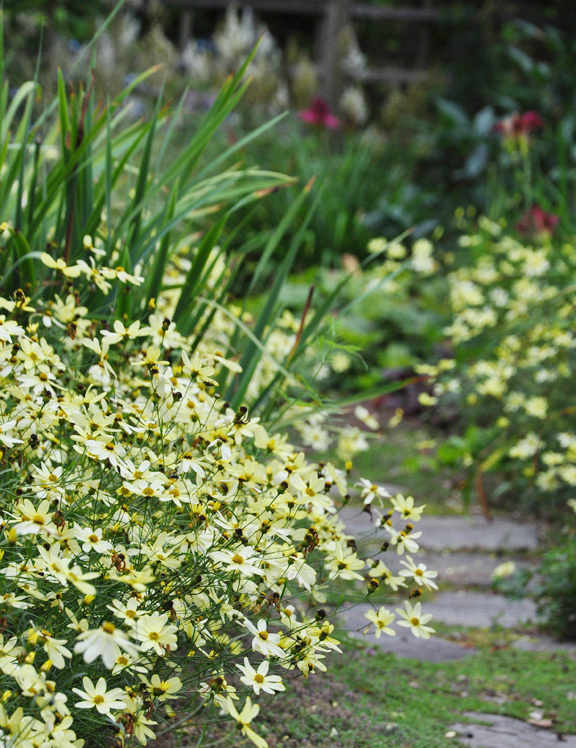 Coreopsis verticillata 'Moonbeam' has soft yellow flowers and fine, ferny foliage. 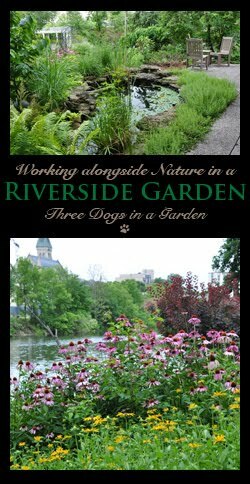 It tolerates heat and humidity well making it a good choice for edging a sunny border. Full sun. Height: 30-45 cm (12-18 inches), Spread: 30-45 cm (12-18 inches). USDA Zones: 4-9. Coreopsis is yet another plant with many variations on a color theme. It is important to note that not all of the new cultivars are as hardy and as reliable as older varieties like 'Moonbeam'. Many of are sterile, so they won't even reseed themselves. 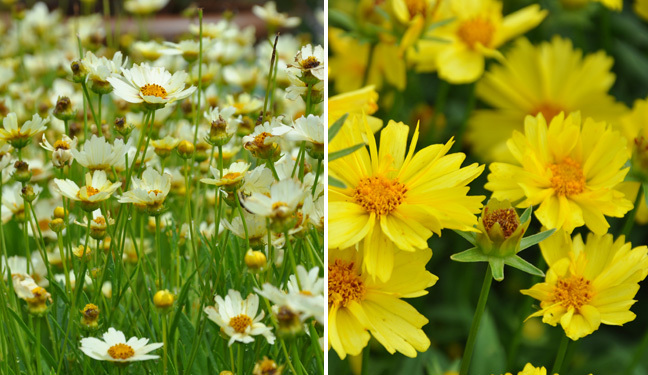 Big Bang Coreopsis 'Star Cluster' (top left) has creamy white daisies that sometimes develop a maroon-purple eye. 'Star Cluster' forms an upright mound of fine, narrow foliage. Plants may require some support if grown in good garden soil. Full sun and average moisture conditions. Height: 45-60 cm (18-23 inches), Spread: 45-60 cm (18-23 inches). USDA Zones: 4-9. Coreopsis Leading Lady 'Lauren' (top right) has single yellow flowers. It was bred to be floriferous, mildew resistant, cold and heat tolerant. 'Lauren' also blooms earlier than most Coreopsis. Full sun and average moisture conditions. Height: 45-60 cm (18-23 inches), Spread: 30-40 cm (12-16 inches). USDA Zones: 5-9. 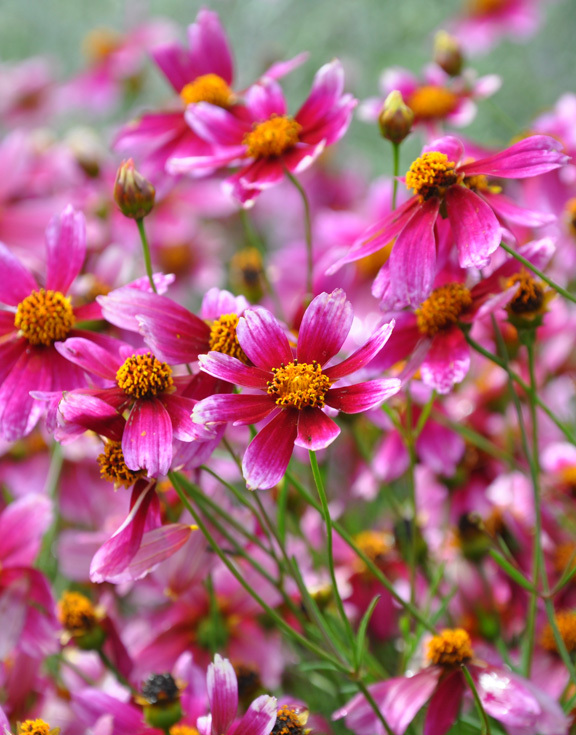 Coreopsis 'Dream Catcher' has cool pink daisies with a maroon eye. Full sun and average moisture conditions. This variety is hardier than most pink forms. Full sun. Height: 30-45 cm (12-18 inches), Spread: 45-60 cm (18-23 inches). USDA Zones: 5-9. 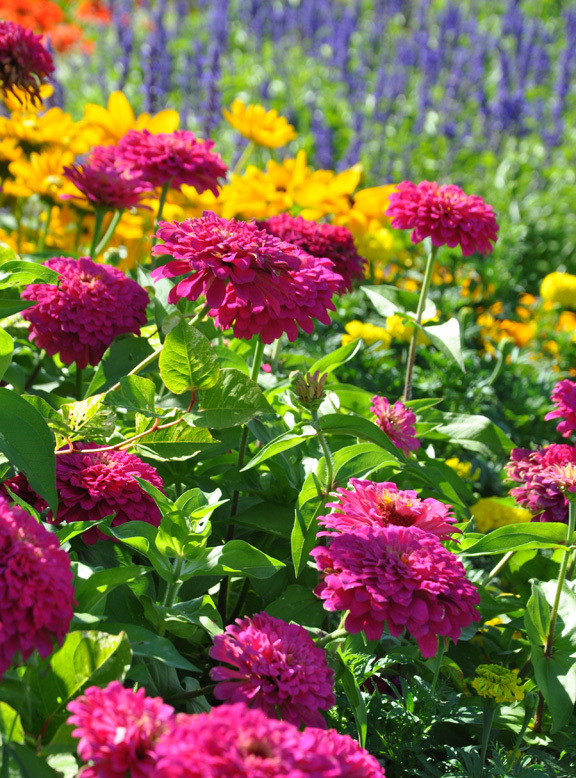 Annual Zinnias make great companions for late summer daisies and grasses. Zinnias in a local public park. 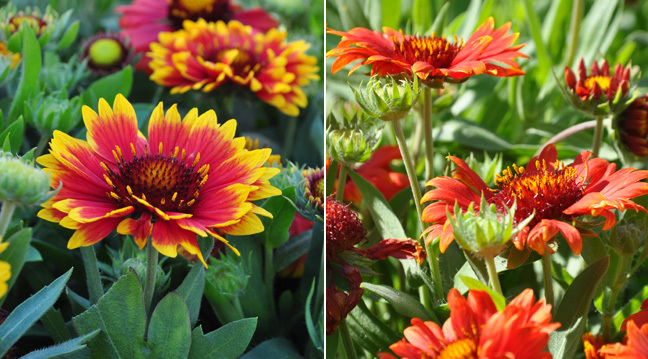 Gaillardia aristata 'Arizona Sun' (top left) has orange-red flower petals with yellow tips. Full sun. Height: 20-30 cm (8-12 inches), Spread: 30-40 cm (12-16 inches). USDA zones: 2-9. Gaillardia aristata 'Arizona Red Shades' (top right) has orange-red flowers. Full sun. Height: 25-30 cm (10-12 inches), Spread: 25-30 cm (10-12 inches). USDA zones: 3-9. Gaillardia x grandiflora Mesa 'Yellow' (bottom centre) has solid yellow petals and a large golden eye. Full sun. Height: 40-45 cm (18-23 inches), Spread: 40-45 cm (18-23 inches). USDA zones: 4-9. 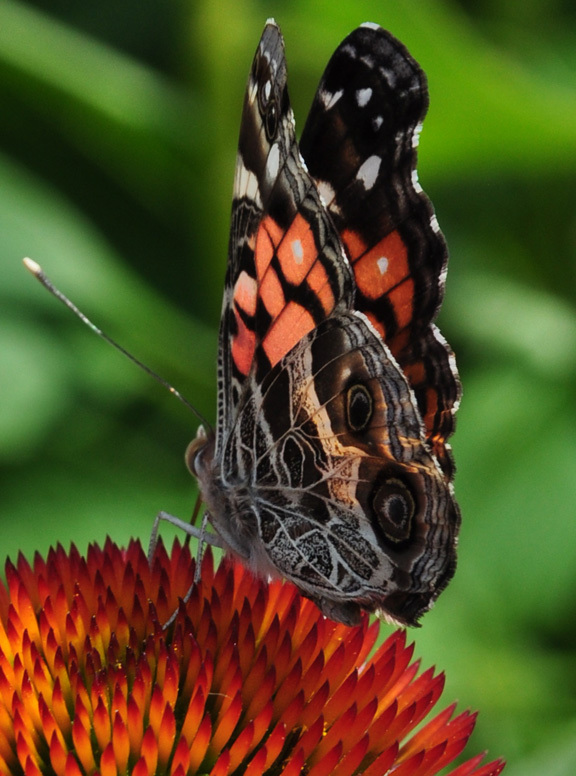 These pictures have been pulled from a wide range of gardens. It just goes to show you how versatile daisy-type flowers can be. 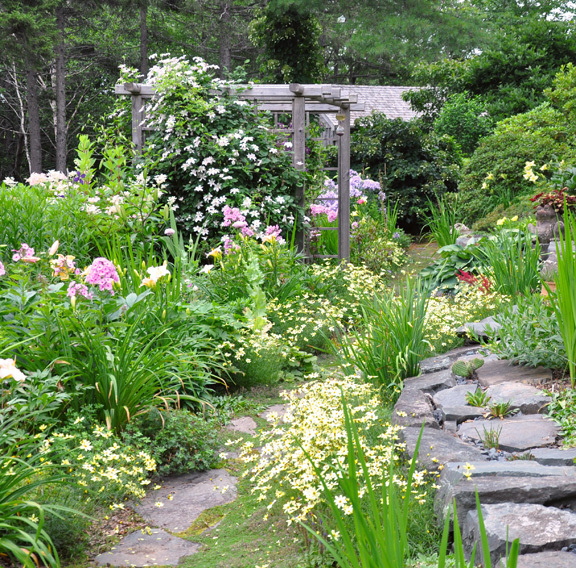 I hope you have found a little inspiration for your garden in my many examples. P.S. The latest book winner will be announced shortly! Thank you for all of your examples of fine fall flowers. Now to decide which ones to start with. It's nice to have some many possible choices, isn't it. It allows plenty of room for creativity. What a beautiful selection of late summer flowers, Jennifer! These photographs are truly wonderful. I especially love the Floss flowers. I don't think I've ever seen them before. Thanks Lisa! Yes, I think I am going to find a place to use Floss flowers next summer. I love that blue color. WOW! What a beautiful and colorful flowers.My eyes became fresh by seeing the colorful pics of the flowers. 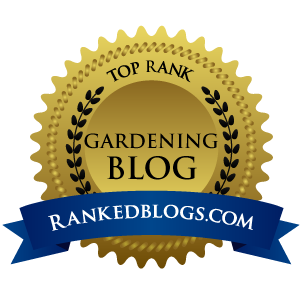 Well, I'm so glad for this post because I LOVE Rudbeckias and am always on the lookout for "pairings" for them. 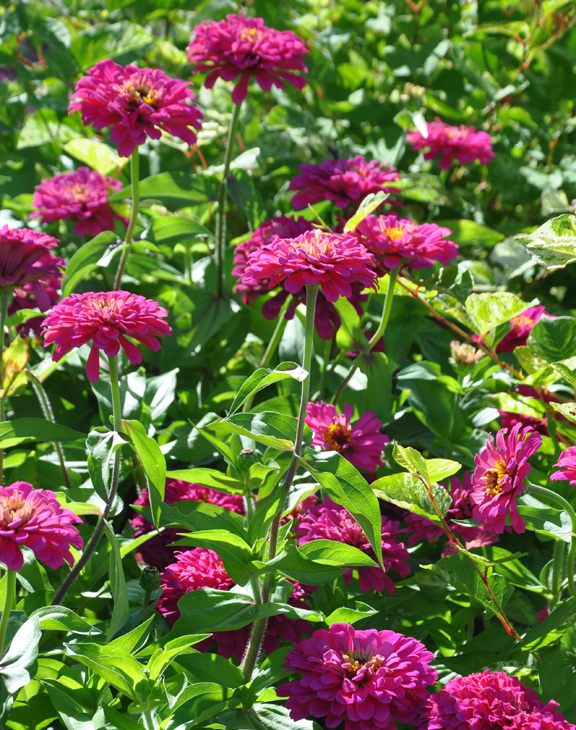 I never thought of zinnias--DUH. It looks GREAT. They do make a nice paring, don't they? I love Zinnias. Such happy vibrant colors! Wow! The photos in this post are OUTSTANDING!! Thanks for brightening my day! I'll have to "borrow" some to use as wallpaper on my desktop. I have some of these flowers in my garden. Unfortunately, it's been a rather dry summer in Pennsylvania and my August garden looks more brown than lush. I love Coreopsis and have tried it many times. Rabbits always find it and eat it to the ground. Oh well. Thanks for the kind words Kimberlesk. There are parts of my garden with some brown plants. We had the same dry summer here. Thanks for the inspiration! 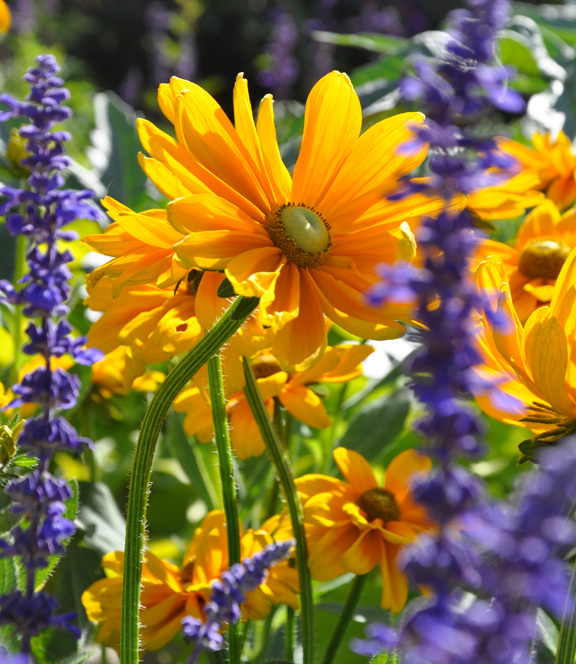 I have the Rudbeckias but why didn't I think of putting blue with them! It is a nice combination, isn't it? Jennifer, I love your front garden and Ageratum, it's annual and gives many seeds. One year I had grown its seedling, but that is a lot of work, as I have veggies' seedlings as well. 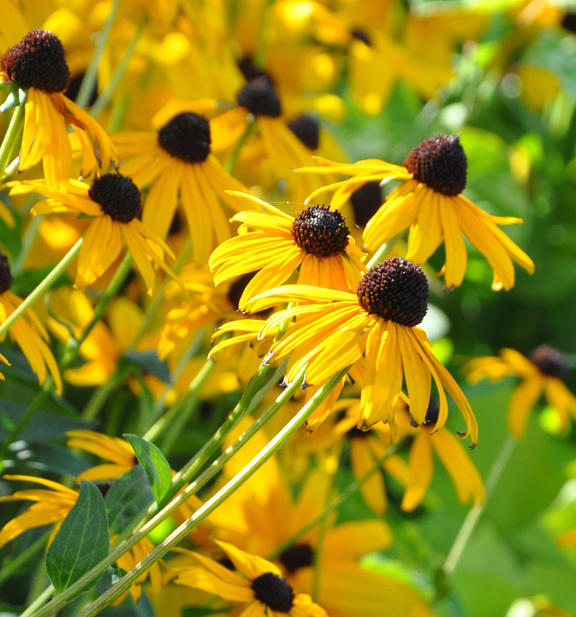 I also had Rudbeckia hirta and I didn't know its name :) Thanks for information! 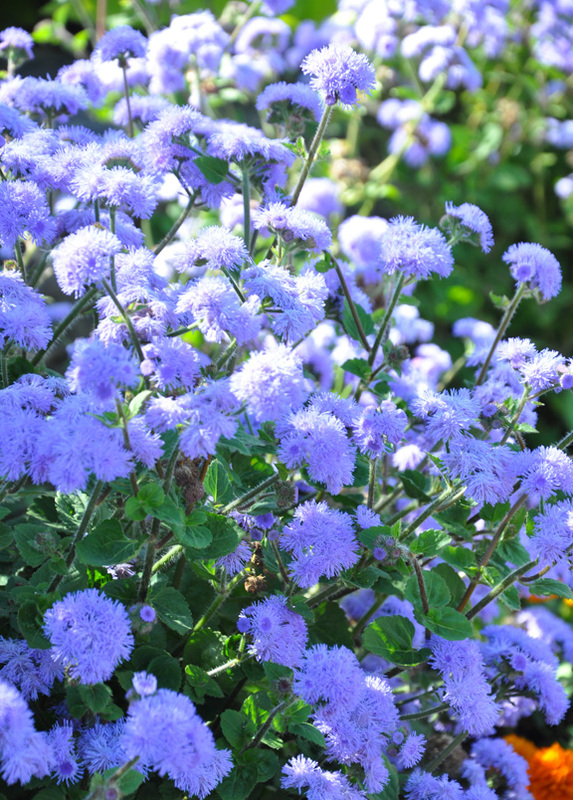 For some reason I saw a lot of Ageratum in the clearance section this year at the local garden centre. I think it is really quite pretty and good blue annuals are few and far between. I brought home a helenium called ruby charm. It is the cutest little flower. I've never seen coreopsis in pink before. I'll keep my eye out for it now. I love Heleniums Stacy. I wish I had a few more of them. I am sure "Ruby Charm' will be a great addition to your new garden. Love this post! Here it is, August and I'm thinking coreopsis, zinnias and floss flower absolutely need to be in my garden next year.